Traveling alone left me susceptible to a roller coaster of moods, simple pleasures are immensely enjoyed, but the doldrums are always dangerously near by. 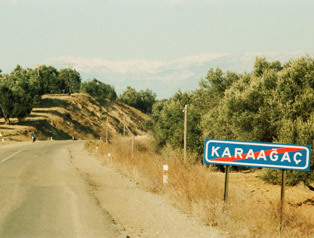 The two days following Bergama were both easy (63 km. and 46 km), but my spirit was low. The weather had been cold and clear up to this point, now it was cold and overcast, threatening to rain or possibly snow. As I rode I always kept my eye out for friendly tractors or other slow-moving vehicles; I wasn't willing to hop on a bus yet but tows of even a minute or two were inevitably the highlights of my day. 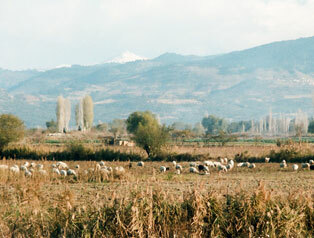 My third day out of Bergama and my 9th in Turkey saw a required 95 k ride to get to the next town of any size, Balikesir. I had been told the hills weren't bad; they weren't--they were miserable And it was cold. At the beginning of the day I saw snow-capped peaks on the horizon and stopped to photograph them--after all, I was biking in shorts within sight of snow. A few hours later I was making a snowball for my camera. I was cold on that bike and not sure just what I was doing riding alone through Turkey in December. I don't even enjoy biking I surely don't enjoy biking above the snow level. I can't remember the last time I was really warm--now I'm actually shifting from being cold to freezing. I was worried about my water bottle for a while there! I'm so close to accepting the first ride I'm offered all the way to Istanbul-- the future value of sharing my adventure with friends for the next 50 years is surprisingly worthless right now--I'm just trying to make it another week. Well-- you get what you deserve biking alone in December. My poor attitude was soon put on the back burner however, since if I used the ferry at Bandirma to cross the Sea of Marmara, Istanbul would be only two days away. It was drizzling the morning after I arrived in Balikesir, and the Bandirma-Istanbul ferry made even more sense. I asked a few locals whether it could rain during the day--half said yes, half said no. I left Balikesir and arrived in Susurluka dry. Three more dog attacks, though-- two backed away when I stopped the bike, the third got the message only after being beaned by a stone. Sunday, December 16th, and what will be the last day of my tour--only 52 kilometers to the port of Bandirma -- Istanbul as far as my bicycling is concerned. It's another quiet day: overcast skies, only one dog attack (defeated by a squirt from my water-bottle) and, for the first time in six weeks, a flat tire. With the ferry due to leave in an hour I rush to change tubes and ride the last kilometers to the town. I follow the international road signs depicting a ship until I am at the ferry. 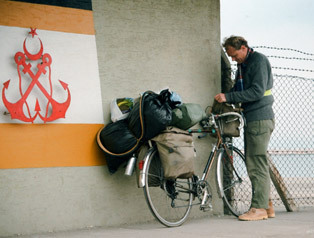 I ride onto the car deck, brace my bike against a bulkhead, and lock my panniers, bringing my journal and a pen upstairs. My trip, my first bike tour, is finally over, eleven countries and six months after arriving in Belgium. I begin to write. I stopped to photograph the snow-capped mountain in the distance. I stopped again. This was a better picture. Although I was in shorts, it was my fingertips that were the coldest, since they weren't doing anything. 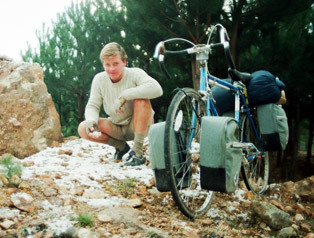 The only bicyclist I met in Turkey -- as I recall, he was Scottish, and a professor of some type.